HQ Stitch. Find the perfect machine for all your sewing and quilting needs. Curious about how a long arm machine works? Stop in for a FREE test drive on a Handi Quilter Avante 18 or Infinity 26". You will love the feel of how easily our machines are to use, control and handle. 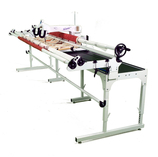 Various machine packages are available with and without the pro-stitcher computer technology …always at the lowest price allowed. We will work together to find the machine that best suits your needs. Set up and training is included with all new machine packages. Handi Quilter recognizes that quilters need reliable, low maintenance machines that also look fantastic in their studios. The highest standard of innovative technology and precision engineering provide the smoothest stitch quality in the industry. WITH HANDI QUILTER YOU WILL BE ABLE TO FINISH MORE QUILTS. I have customers wanting to upgrade their machine packages. Contact me for more information on used machines that may be available. Quilting for You carries a large inventory of tools and supplies for use in long arm quilting. Below is a list of items that are in stock.